What Is the Mystery Behind the Garbage Island in the Pacific Ocean? We’ve all thought about it. Whether it was a book, television series, a movie or even a video game that sparked the idea, we’ve seen a version of the post apocalyptic world—the Earth as it stands after a catastrophic event. The planet is no longer green and fruitful, with beautiful oceans that allow it to sustain life. All viable beings have been evacuated from the universe, and now robots are doing what they can to get rid of waste in hopes of making this rock a salvageable place. It can be an absolutely terrifying concept that throws you into an existential crisis. However, when it comes to the reality of our current waste management system, it’s actually a feasible future. Here at Green Think Recycling, we spend a lot of time talking about how keeping the go green mindset will change our world. Why is it that we’re still so negative about the way our planet will end up? Most people aren’t aware of the state of our oceans and just how careless we have treated mother nature. The buildup of waste is unimaginable. The most out there example of this is the Great Pacific Garbage Patch. If you’ve never heard of it, you’re not the only one. As an embarrassment of immense magnitudes, this isn’t something that your local news station or classroom science textbook is going to brush up on. This mass of trash is known around the world for its major size, thanks to our lack of recycling prowess. Of the five collections of waste in our oceans, this one holds the title as the biggest and it doesn’t appear to be changing any time soon. What can you do to clear up the ocean as someone who is landlocked? We all know how proud Texans are of the fact that everything is bigger there. It’s one of the largest states in our country, and it can be hard to imagine crossing the entire state in one go. What about taking the trip all the way across to the east side and then coming all the way back to the west? If you think that might be a challenge, however, you’ll be surprised to hear that this great garbage patch sitting in our ocean is twice the size of this state—the equivalent of that extra long trip. A breakdown of the waste management numbers tells us that this collection of garbage and what could be recycled material is actually a full 1.8 trillion pieces. The waste weighs 88,000 tons, the same as 500 jumbo jets. These numbers are 16 times higher than we had originally thought, shocking every kind of scientist there is. 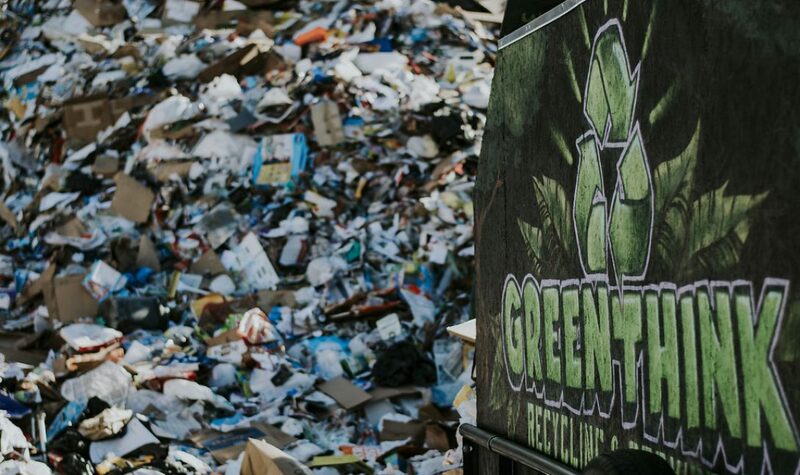 If we don’t change our disposal efforts and incorporate serious recycling reform now, we’re going to find that the problem escalates to unimaginable proportions. Thanks to the 1.15 to 2.41 million tons of plastic that enter the oceans through rivers each year, and the wind and converging ocean currents, this trash has hit the perfect storm in which to continue collecting. Its home between California and Hawaii make it impossible to see, and harder to believe that it exists. Much like climate change, this great garbage patch has vehement deniers. It’s hard for these folks to believe that the waste management crisis can be so bad without being broadcast on a large platform. Unfortunately for the deniers, the most recent organized study would tell us that these numbers have been confirmed and denying them won’t help the recycling crisis. Researching this mass of plastic used to mean dragging a net through the top layer to get an idea of what the waste looked like. Unfortunately, this skewed the results, as well as the depth of the problem. This was because the nets were really good at picking up small amounts of plastic but never the large pieces. In addition to that, they could only reach the top layer of rubbish. As our waste management efforts have improved, so too have our research processes. In 2015, a research lineup did what was once considered impossible for go green teams. They put together a squad of 30 boats and 652 nets. In addition to that, they set up two flights over the top of the mass to measure the size from an aerial perspective. The difference with these nets was the fact that they were built as multi-level trawls. For the average person who has no idea about varieties of nets, this means that the tool was built to be able to reach 11 levels down. These nets pulled in over 1 million samples of plastic that litter the waters of our oceans. At this point in the process, it was time to get a better understanding of this waste. Each piece of plastic was cleaned, counted and classified by size. Beyond that, these items were then scrutinized for what kind of toxicity they could bring to our environment. After years of analyzing, understanding, and downright being upset at our lack of recycling efforts, this information was compiled into one comprehensive computer model. At this point, we finally have an idea of what’s going on with our most important resource: water. Science fiction has been changed into science facts. Why should you be scared into improving your waste management efforts? Despite the best recycling efforts, there has been no dent in the amount of waste that sits in our water. In fact, by using the data it is estimated that the plastic mass is the equivalent of 250 pieces of waste per every single human on this planet. This is, of course, only considering the potential recycling that sits on top of the water. What hasn’t been factored in are the items that lay on the ocean floor. This ticking time bomb of a trash island presents an ever-present threat. We don’t want the mass to break down into smaller, unmanageable pieces of waste. Lack of proper disposal can have a serious threat on the food chain. What is this waste already doing to our planet? It all starts in the marine environments. What Is It Doing to Our Environment? At the top of the disposal chain sits the large pieces of plastic. These are the first threat to our recycling procedures. These large items matter because they can and will break down into micro-plastic over time. This deterioration happens because of sun exposure, the waves of the ocean, marine life and the changes in temperature. Micro-plastics are often mistaken as food by animals that don’t have the critical thinking skills to know any better. When animals mistake pieces of rubbish as food, it can result in an indirect malnutrition. This is true for all of marine life in the ocean. Without proper waste management systems, we’re leaving these animals with no hope for survival. One major example of this is with sea turtles within the area of this Great Pacific Garbage Patch. Upon examination, these creatures have been shown to have up to 74 percent of their diet made up of plastic. If they aren’t fooled into eating the garbage, these poor things will often end up tangled in the large items like nets. With no one to help these animals, they die. Humans don’t get off the hook either. We can show measureable harm that for most people goes unnoticed. Small fish eat the plastic, and it makes its way up the food chain. What should have been simple recycling is now haunting this creature. A larger predator will then eat the small fish. Though the whole plastic won’t stay with these larger animals, they do hold onto chemicals. It slowly moves up the food chain, but humans end up with chemicals running through us, though we thought we were safe. As frustrating as it is for the go green community, no one has taken responsibility for the trash yet. This is due to many factors, including lack of resources. But the biggest element affecting this waste management problem is that this trash doesn’t fall under anyone’s jurisdiction. Instead, these islands lay in international waters. The responsibility is passed on to privately funded groups who take the lead on the disposal of the waste. Now you have an idea of what was meant by the post apocalyptic metaphor. What is the future going to look like if we have this much garbage casually hanging out in the open waters? Are these waters even going to exist 100 years from now? We can do more than just hope. It’s up to every single one of us to guarantee that our waste doesn’t end up in the water. This means taking the extra time to prepare when heading out to local rivers or making a journey to the beach. As you spend time in these areas, you can go even further in your go green efforts by picking up any trash that you come across. However you choose to improve your waste management efforts, it’s important that you just do it. Nothing can replace the help of the human hand, the search for “recycling center near me” and the good intentions that we all have. Next Post How Many Times Can Recycled Items Be Recycled?